They’ve spent years at the same high school without speaking a word to one another, but that’s all about to change. Popular Bliss was having the perfect prom until she found her BFF and boyfriend making out in the back of a limo. Bad girl Jolene wouldn’t be caught dead at the prom, yet here she is, trussed up in pink ruffles, risking her reputation for some guy—some guy who is forty minutes late. And shy, studious, über-planner Meg never counted on her date’s standing her up and leaving her idling in the parking lot outside the prom. 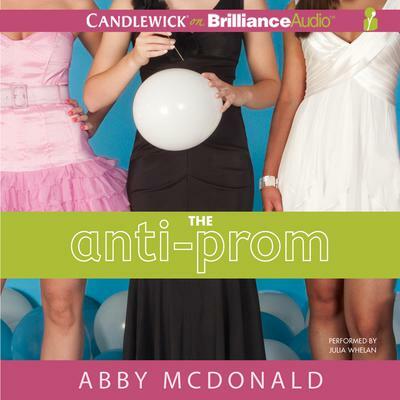 Get ready for The Anti-Prom, Abby McDonald’s hilarious, heart-tugging tale about three girls and one unforgettable prom night.